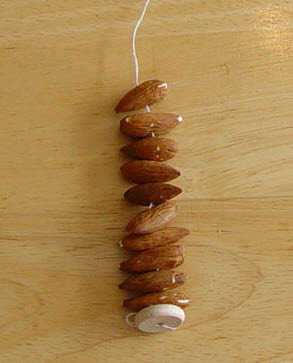 Put almonds on a string to make a toy for your bird! Cut a piece of string and thread it on a needle. Tie a wood bead on the ends of the string. Set an almond on a piece of cardboard, then put the needle through the center of the almond. Once through, push the almond to the base of the string. Continue threading almonds until the string is full. Hang the toy in your bird’s cage.